I read this book as research for a short story I’m writing set in Victorian England. However, the content here is so well delivered and organized that I believe this would be an enjoyable read for anyone remotely interested in this era. While a thick book, these approximately 500 pages only scratch the surface of possible topics regarding an entire era. Even with long chapters, the book reads surprisingly fast, because practically every sentence contains interesting information conveyed through strong writing and a logical flow. Flanders organizes her content by room, which is fitting for the ideology of the era: that each room should have a specific, distinct purpose. Flanders also uses each room as a jumping off point for relevant topics such as money, servants, food, etiquette, and fashion. Add in several sections of lovely color photographs and this book is well packed with fascinating content. INSIDE THE VICTORIAN HOME is clearly very well-researched with a hefty chunk of pages at the end devoted to footnotes and further reading. While this is the only research book so far that made the cut for a review (in other words, that I thought someone not specifically doing research would still enjoy), it also proved a great starting point for discovering other resources, especially nonfiction from the era (like the infamous Mrs. Beeton). 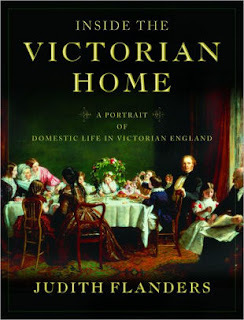 If you find yourself at all curious to know more about the Victorian era, I doubt I could recommend a better book. I have a growing love-hate relationship with this author’s work. I love her work, love love love her work. None of my criticisms will keep me from gushing about her to others or eagerly snatching up everything and anything she writes. However, she employs a specific suspense technique in all her work that is one of my top pet peeves in writing. The pet peeve in question is withholding information for as long as possible to build suspense. The reader knows that there is important information being withheld, but not what, the idea being that the desire to know what will keep one reading. In Moriarty’s case, she establishes very early on in her novels that there’s a big secret, almost every chapter will continue to elude to and tantalize about this secret, but typically the secret is not revealed until halfway or even two thirds of the way through the book. As a very character-centric reader, I find this technique skews the focus in a different direction than I want and only serves to frustrate me. 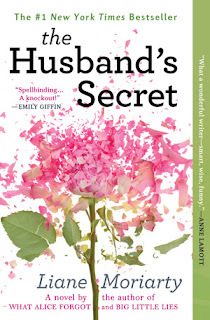 THE HUSBAND’S SECRET establishes the withheld information right in the title. What is the husband’s secret? Then the book opens with a wife finding a sealed letter addressed to her in her husband’s handwriting buried amide old boxes of paperwork. He’s out of town and when she innocently mentions the letter she found, he begs her not to open it, to throw it out and forget about it completely. Suspicious. The letter’s secret is not revealed until almost halfway through the book. Meanwhile, the chapters include plenty of scenes excessively reminding us about this unrevealed secret: the wife repeatedly staring at the letter in a battle of conscience, the husband telling her multiple times not to open it and not so artfully inquiring into where she put it. That’s not to dismiss the entire first half of the book. This technique annoys me enough that I would not like this author’s work if something didn’t more than redeem her books for me. That something is characters (and writing, though you can lump them together in this instance). Moriarty always presents a large cast of distinct and complex characters and I relish getting to know how each one sees the world differently. Even when I find myself frustrated at the slow reveal aspect, I nevertheless enjoy every word as I get to know the characters, their motivations and relationships. As a writer myself, I understand that Moriarty is prepping us for the big reveal by giving us time to invest in the characters. The first book I read by her - BIG LITTLE LIES - is in my mind a perfectly paced example of her own style. I never found myself frustrated about withheld information and the big reveal both surprised me and made perfect sense. Unfortunately, with the others I have read since then including THE HUSBAND’S SECRET I called the reveal before it happened, which then takes away from the effect of that moment and makes me all the more frustrated for how long I waited for that information. Another issue I had with this book is that the ethics of everything seemed black and white to me. This author specializes in complicated dynamics and moral grey areas, but nothing was grey here for me, though I expect others will feel differently. I do not mean this as the criticism it no doubt sounds like, for I still enjoyed reading about why these tortuously conflicted characters, with all their unique perspectives, see grey where I see black and white. Yet a small part of me felt much of their inner turmoil could be chalked up to nothing more special than self-justification and I couldn’t help wanting them to set aside all their excuses and do what’s right (in my opinion). That all said, this is exactly what I love so much about Moriarty. She makes me care. I feel so opinionated on everyone’s actions in her books, which isn’t the case with a dull or unbelievable character. I can’t wait to read what happens next to everyone and I have genuine emotional responses to decisions the characters make. Despite feeling secret-taunted, I would highly recommend Moriarty’s work to anyone who will listen, but especially those most interested in good character development. 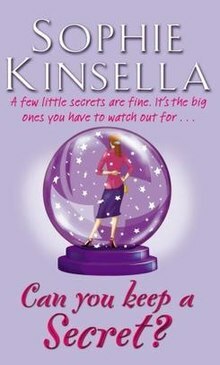 The short chapters make it a fast read and her nuanced relationships make every single page up to and beyond the big reveal addictively enjoyable. This one was a re-read for me and actually quite matched my original impressions of it. The book is a lighthearted chick lit novel with unexpected moments of subtle feminism. Our protagonist Emma is a nervous flyer. When her plane hits some extreme turbulence, she starts spilling her every little secret to the man sitting next to her, convinced she’s about to die. Of course, she doesn’t die, but she does learn not long later that she confessed everything from her real underwear size to a fib on her resume to none other than her new boss. Well, her boss’s boss. Or her boss’s boss’s boss. Point is he’s the head of the company. Awkward. Emma is a laywoman, written very much in the style of Brigit Jones. She sometimes comes across as superficial, but I find that true of most chick lit novels. I think of them more as pure entertainment reading, not intended to provoke deep discussions of the human condition or turn my understanding of the world upside down. Nope, this book is designed to make you smile and laugh and enjoy, and that it certainly did.